In August 2017, NSW enacted a new Land Management Framework. We said goodbye to the former Native Vegetation Act 2013 and Threatened Species Conservation Act 1995. In their place, we now have a complex regime for vegetation clearing and biodiversity regulation comprising the Local Land Services Act; Biodiversity Conservation Act; Environmental Planning and Assessment Act and the raft of state environment planning policies that govern various aspects of vegetation, environment, infrastructure and state significant infrastructure. 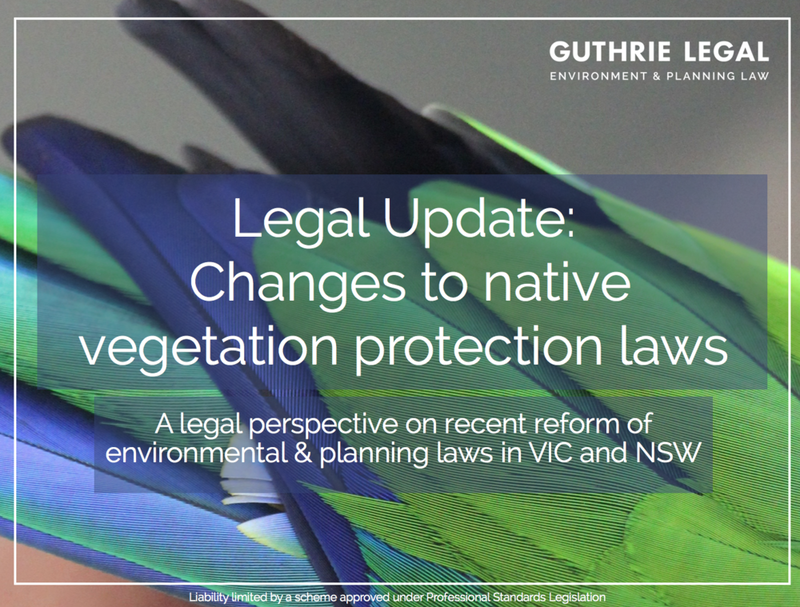 In Victoria, we also had some changes in December 2017, to our planning schemes, which changed several SPPF clauses and particular provisions in relation to assessment and approvals consistent with the Government's new policy "Protecting Victoria's Environment - Biodiversity 2037". There are also new "Guidelines for the removal, destruction or lopping of native vegetation" which replace the former guidelines “Permitted clearing of native vegetation – Biodiversity Assessment Guidelines”, which were incorporated into the Victoria Planning Provisions and all planning schemes in Victoria. It was a great pleasure to address the 2018 Australasian Network for Ecology and Transportation Conference today on the key changes and their implications for linear transport projects. It was almost universally agreed that the new regime is tough for linear infrastructure managers and proponents to navigate, particularly given that linear infrastructure necessarily traverses different land types. There are so many challenges: development obligations versus operational clearing requirements; lack of clarity on offsets and assessment requirements. I love to share my insight, so get in touch if you would like to pick my brains or have a briefing to your organisation on the new approvals regimes or operational requirements. For an abridged copy of my presentation, click on the link below. If you have questions, get in touch!